TEL AVIV: Israel has asked Pakistan to "ensure full justice" to the 26/11 terror attack victims on the 10th anniversary of the carnage in Mumbai carried out by 10 terrorists belonging to Pakistan-based Lashkar-e-Taiba. About 166 people, including six Israelis, were killed in the terror attack. At a memorial event organised on Monday evening by the Indian mission here to mark the anniversary, Michael Ronen, Director, South & South East Asia Division at the Ministry of Foreign Affairs of Israel emphasised that it was important for the international community, especially Pakistan, to ensure that the perpetrators and facilitators of the ghastly attacks do not go scot free. "It is important to provide full justice to the victims and their families," Ronen said, urging "all governments, including the Government of Pakistan, to ensure that the perpetrators and facilitators of the attack are brought to justice." The Israeli diplomat also underlined that the objective of the attack was to cripple the Indian society, economy and culture, as well as the growing bilateral relationship between India and Israel. In this regard, "the terrorist attack failed miserably as the Indian economy has continued to grow stronger, its culture remains invincible and bilateral ties continue to reach new heights," he noted. Asserting that terrorism can only be defeated by international cooperation, Ronen "again called upon the Government of Pakistan to ensure full justice to the victims and their families." 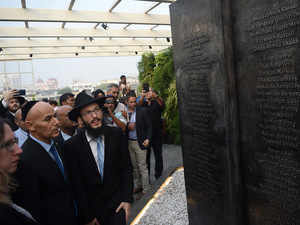 The event was attended by members of the Indian community in Israel, some Indians visiting the country and also Rabbi Shimon Rosenberg, who lost his daughter Rivka and son-in-law Rabbi Gavriel Holtzberg in the attack on Nariman House, also known as the Chabad House.